Coastal living has serious perks—views, waves, sandy beaches. And usually it’s all idyllic sandcastles and sunsets. That is, it’s like that until the hungry beast of coastal erosion starts eating up the beach. Then, next thing you know, your tranquil beach house is sliding down the sandy bank and out to sea. We’ve seen it happen over and over. So while building your house upon the sand is not usually advised, Kiwi architects Crosson, Clarke and Carnachen are breaking centuries of convention, and they’re getting great results. Their multi-award winning Whangapoua Sled House rests on two massive wooden beams and is easily movable to avoid coastal erosion. Up-vote for modernity. 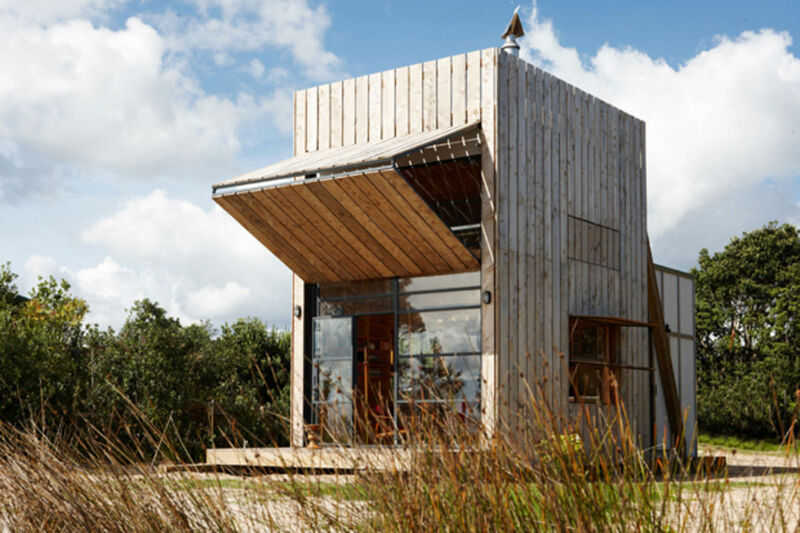 Built in the tradition of the Kiwi “bach” (short for bachelor pad, bach’s are beachside vacation homes that are an iconic part of NZ culture), this movable home rests on New Zealand’s Coromandel Peninsula, and can fit a family of five. Whangapoua sits on a footprint of only 40 square meters, and is totally sustainable. It features a worm tank waste system (for composting) and potable grey water tanks for storing roof runoff. The exterior is a rough macrocarpa-cladding that can be closed completely in the case of coastal torrents, or opened for a sunny open-concept living space. The kids’ sleeping area maximize space with cabinetry toe spaces and secret cubbies, and the adult quarters are accessed by climbing a ladder through a closeable hatch. If you keep scaling the ladder, it’ll open up to a roof terrace with panoramic views. The essence of the Whangapoua Sled House is summed up in three words: small, simple and functional. It’s also extremely smart and, at the end of the day, while rain can ruin some beach time, it’s nothing compared to your home running away into the ocean. So, CCCA advises you to be like the wise man, and build thy house upon the sand. All images via Crosson, Clark, and Carnachan. First discovered on inthralld.